After an incredible 10 day adventure down under with Contiki, i extended my stay for another 5 days in Sydney to jam pack in some more exploring. As soon as my flights were booked, I popped a message to one of my best friends who, last year, moved over from the UK to Auckland, New Zealand. We hadn’t seen each other for over a year at this point, so to be on the same side of the world as each other and not catch up seemed crazy. Fortunately she had some spare holiday left and managed to hop on a 3.5 hour flight over from NZ to join me on the last leg of my Australian adventure. As you know, I’ve been lucky enough to explore Sydney before when I backpacked the East Coast last Christmas. But for my friend, it was her first time. The day she arrived we put our tourist hats straight on, grabbed our cameras and took to the streets. The second day had us take on a roadtrip. One of my favouritest things in the WORLD to do. From following various Australian bloggers on Instagram (come join me – @molliebylett), I had made note of a couple of bucket list beaches that looked incredible on the East Coast. Hyams beach is renowned for having ‘the whitest sand in the world’ winning the Guinness World Record in 2006. And, well, you know me. 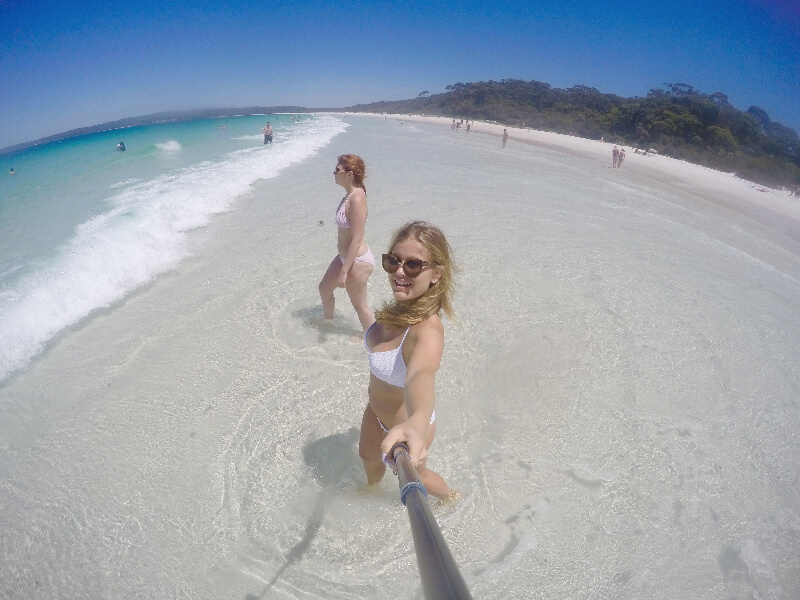 I’m a sucker for a white beach, a blissful spot and a gorgeous photo – Hyams beach seemed to boast it all. The idea was very quickly sold to me and, too, approved by my friend. We decided to not book a car in advance as we wanted to play it by ear and see where the wind (nights out) took us. This obviously meant missing out on some early bird deals online, but sometimes it’s nice to escape routine and just be spontaneous. 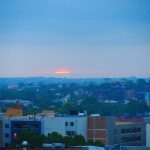 We ended up hiring a car from Redspot Car Rentals, located just on Hyde Park next to the Marriott hotel (where we actually hired a car to see the Kangaroos last time we were in Sydney). We got a top of the range car fitted with Sat Nav for $100 AUD. This included breakdown cover, lowered excess on any damage, an additional cost for being under 25, and just excluded Petrol. We did 6 hours driving in one day though and it only cost around $40 between us (about £10 each). The car was SO smooth to drive, and the service was pretty faultless. The only downside was, the car rental shop shuts at 7pm so if you want to stay out later and make the most of your 24 hour hire, you can, but you need to find somewhere to park it. Sydney parking is very much like London, few and far between and also very expensive. We managed to find somewhere near our hotel and just got up at 8am before the charge begun. Just an additional cost to bear in mind when renting a car! With a car finally sorted, we headed out through the suburbs of Sydney to begin our journey south to Jervis Bay – the host of Hyams Beach. You can take the inland motorway to head south or drive along the coast, both of which take a similar space of time. Obviously with a choice of a sea view or a non-sea view drive we went with the sea view option. Little did we know we would be encountering one of the most beautiful drives Australia has to offer – the Grand Pacific Drive. Just under an hour south of Sydney we joined onto this incredible stretch of road which took us alongside epic coastlines, beaches and rock pools all the way down to Nowra, through Shell Harbour, Wollongong and Bulli. We had a long drive ahead of us and had only allocated a day for this roadtrip so unfortunately didn’t have time to stop off and explore all the villages we found along the way. If you do find yourself in this corner on the world, you can find out more about the amazing routes and stop offs on the Official Grand Pacific Drive Website HERE. Hyams beach really did give The Whitsundays a run for its money. You know when you’re looking at the sea and the colours are just out of this world. So gorgeous you can’t believe they are real. Yep – Hyams Beach owned it. I have to admit here, when we arrived some girls came over to warn us that a shark had been sighted in the shallow waters 3 times that day already. But after all, we are in Australia, the waters are bath temperature kinda warm and apparently it’s Shark season. After splashing around in the shallows, eating our picnic and dozing off in the afternoon heat, it was already time to head back to Sydney. Have you been to Hyams Beach?